Few people in the ancient world could read or write. Even many kings and emperors needed to employ special scribes to make records of their orders and achievements. Unsurprisingly, then, libraries were few on the ground. But those libraries that did exist were often magnificent. Rulers used them to showcase their wealth and wisdom, holy men used them to store religious texts, while learned men used them to try and gather all the knowledge of the known world in one place. Today, little remains of these awesome ancient libraries. Their vast and varied collections, most of them made up of parchment manuscripts or papyrus scrolls, were lost many centuries ago. Even the huge buildings, once imposing and ornate, have largely been lost, either destroyed on purpose or simply left to crumble. Thankfully, however, enough remains to give us a good idea of just how awe-inspiring these ancient libraries were. The Royal Library of Alexandria was a wonder of its age, with 400,000 manuscripts on its shelves. Pinterest. 16. 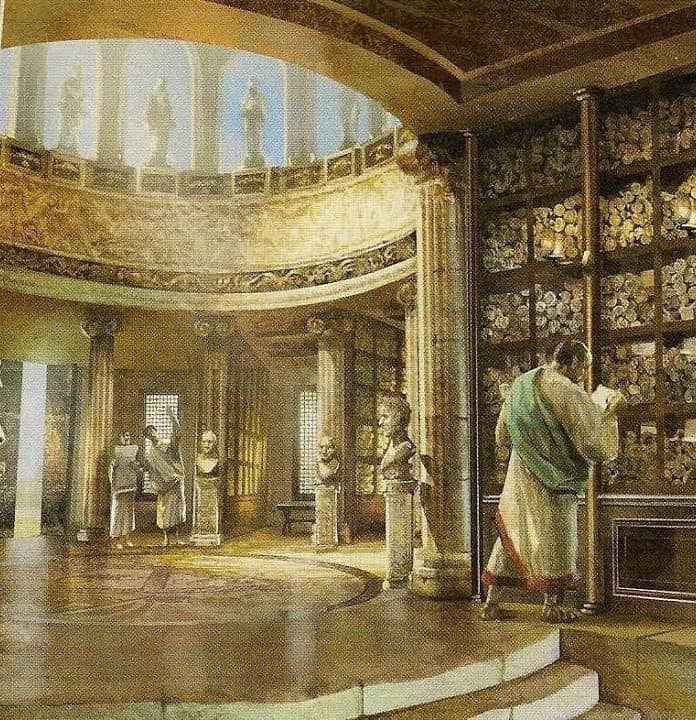 The Royal Library of Alexandria was the most famous library of the whole ancient world, with the personal collection of Aristotle among the 400,000 parchments held there. It’s undoubtedly one of the most famous – if not the most famous – libraries ever built. The Royal library of Alexandria was an architectural wonder. Made up of 10 great halls, each assigned a different area of knowledge, it housed thousands of works. Indeed, it was said that anyone who visited the city of Alexandria was required to take any books they might have with them to the library, where the scribes would make parchment copies. This way, so the legend goes, all of human knowledge at the time was collected and catalogued in the Royal Library. The holdings reputedly included the private collection of none other than Aristotle. Additionally, it was written that Mark Anthony gave Cleopatra 200,000 scrolls for the library as a wedding gift, having looted them from the Library of Pergamum. Tragically, the Royal Library of Alexandria is now famous just as much for its destruction as it is for its vast collections. The story that Julius Caesar was to blame is almost certainly false. It’s more likely that the building and its invaluable papyrus collections were lost for good during the period of civil war which engulfed Egypt in the third century.